To avoid the massive sale crowds yesterday, we decided to go to Shangri-La instead. The traffic was terrible. Took us almost 30 minutes just to get to Wack-Wack from our house instead of the usual 5 minutes! So jealous of your turtle ring!!! Ooh, I love hearing from other fashionable mommies! You blog is awesome, filled with great inspiration and you are so cute! Thanks for stopping by my blog! I am now a follower! love your outfit and the colour of your nails!! You are so pretty! I love your turtle ring too! I agree, it's much more fun wearing something with special meaning attached to it. great outfit love the flared jeans and the rings! i miss Shang!! huhuuu! :( I love your outfit! especially your turtle ring! :) And you get threaded?? I can't do that! I get my brows waxed! haha! love the jewels! 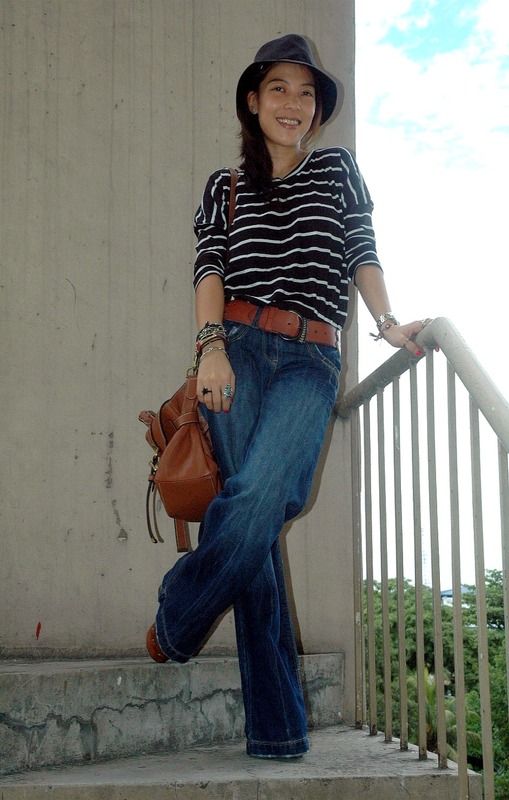 great outfit with the wide leg and stripes....and of course a fedora makes evvrything better! Just found your blog! Love it! You look great in these photos. Following you now. what a bohemian look!! 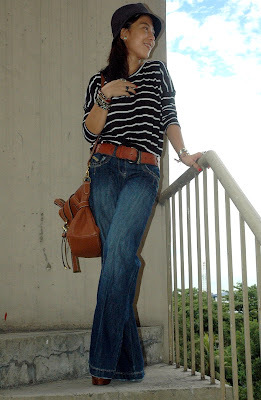 love the striped tee and the fabulous jeans! the jeans has the most fabulous cut and i love the dark color. the best part for me is the combination with the brown accessories. they look so amazing together. This is one of my favorite looks! 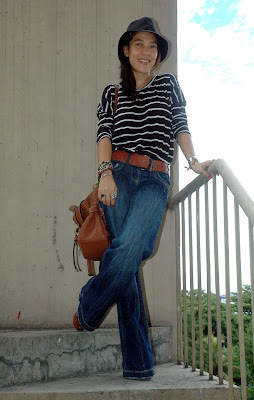 I love a tomboy-inspired outfit! Great look from clothes to the accessories, as always, I love the shoes. thank you so much for visiting my blog,come back soon! 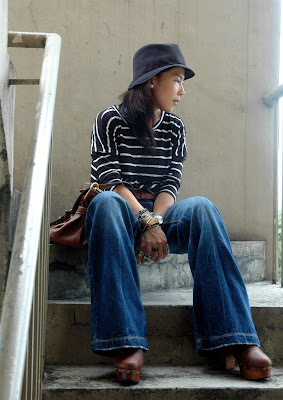 this is great laid back look, i love the widelegged pants! Even thought i have a turtlephobia (i dont even know why) i reeaally like your ring!! I totally agree about accesories, they're even cooler when they're given with love from someone special! Great look you have here! I like it a lot. 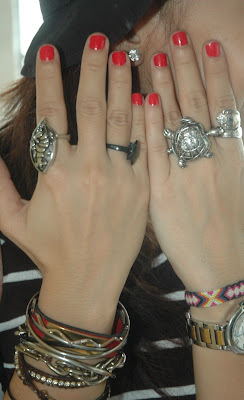 lovely :d I really like your rings!